Here is a recent CNBC interview where I discuss the economic situation of the U.S. and European economies. Here is an interview published by INSEAD knowledge where together with one of my colleagues (Douglas Webber, a political scientist) we answer questions regarding the future of the Euro both from a political and an economic angle. Accumulating foreign reserves: private or public? The global imbalances that we have witnessed over the last years have led to significant changes in the net investment position of some countries. Those with persistent current account deficits (e.g. the US) have seen their net investment position deteriorate, while those with persistent current account surpluses have seen their net investment position improve (such as China). An improvement in the net position represents an increase in the foreign assets held by that country relative to its liabilities (domestic assets held by foreigners). In some of the surplus countries (certainly in China), the majority of the accumulation of foreign assets has resulted in large increases in the amount of foreign assets held by the public sector (government or central bank), what is known as foreign reserves. Have they gone too far? Is there an optimal amount of foreign reserves for a country such as China? "In terms of aggregate foreign exchange assets, in a broad sense, at year-end 2009, China held USD 3.46 trillion in foreign financial assets, far lower than the developed countries in North America and Europe. The main problem at present is that most of China 's foreign exchange assets are controlled by the government, leaving only a small proportion in private hands. Specifically, foreign exchange reserves held by the Chinese government account for two-thirds of all foreign assets in China, compared with only one-sixth in Japan. Therefore, we encourage businesses and individuals to hold and invest in foreign exchange so as to diversify the mix and to distribute foreign exchange within the private sector. This, of course, takes time. With the development of our national economy and the increase in income, enterprises and individuals will have greater demands for diversification of asset allocations. If more foreign exchange investment channels and products are provided for the public to reap concrete benefits from the foreign exchange, then the foreign exchange pressures on the government will be greatly relieved." The opening sentence is a claim that the overall level of foreign assets in China is not that high if you consolidate the public and private sector. Is this true? The table above summarizes the gross international investment position for the US and China in 2009. By looking at the first row we can see that the claim by SAFE is correct. The overall level of foreign assets (public and private) held by domestic individuals, companies or institutions in the US is more than 130% of GDP, significantly higher than in China (around 58%). However, in the case of China the majority of these assets are held as foreign reserves, i.e. they are in the hands of the government or central bank; foreign reserves in China represent more than two thirds of all the foreign assets. It is this unusual volume of foreign reserves what drives the headlines about excessive foreign reserves accumulation in China. But the SAFE claim is correct: if one is willing to consolidate the public and private holdings of foreign assets China is still far from the levels of the advanced economies. But is the public/private composition relevant to understand these numbers? Let's first understand the comparison between China and the US. No doubt that as a country opens up to international capital flows and individuals and companies diversify their portfolio of assets, we expect to see an increase in the amount of foreign assets (as % of GDP); that's why the US (or advanced economies) have a much higher ratio of these assets relative to GDP. In the case of China, the flow of foreign assets (a result of exports and capital inflows) ends up in the hands of the government because of restrictions on capital flows (domestic agents see no value in holding foreign assets or are not allowed to invest in the assets they might want to hold), which is unusual. But if we take the view that what matters is the aggregate (public + private), does this mean that the level of foreign reserves in China is too low? No, this would be the wrong reading of the numbers or the debate. What matters in this debate is the net investment position which keeps improving (+30.5% in 2009) and it is the outcome of current account surpluses that reflect an imbalance which is not sustainable (or, possibly, optimal). It is true that if capital markets in China were more integrated with the rest of the world and more individuals and companies diversified their portfolios by holding foreign assets, we would not see such a high level of official foreign reserves in China. But this would not change the diagnosis of the situation. As long as the exchange rate remains undervalued and the current account in surplus, we would still see a continuous improvement in the net investment position as a sign of unsustainable global imbalances, regardless of the ownership composition of the foreign assets. One lesson from the tax cuts deal in the U.S. The recent agreement on tax cuts in the U.S. has generated a heated reaction. There are different readings about the economic and political consequences of the agreement (Mark Thoma provides a nice summary of some of the reactions). The deal represents a very interesting political agreement between the Obama administration and the Republicans. Obama concedes by maintaining all the "temporary" tax cuts of the Bush administration, even for individuals earning above $250,000 and the Republicans decide to ignore their campaign statements that reducing the deficit should be a priority. The outcome becomes an additional fiscal policy stimulus in the form of tax cuts and, obviously, a higher projected deficit for the coming years. I am very sympathetic to the idea of using again fiscal policy as much as possible to bring the economy back to potential, so there is an element of good news in the announcement (although maybe the agreed policies are not the best, spending might still be a more powerful fiscal policy tool to deal with the current circumstances). But beyond the economic consequences of the announced tax cuts, there is one clear lesson from this experience: reducing budget deficits in the U.S. will be a challenging task. And if the plan requires increasing taxes then you need to wait until there is a real crisis of confidence and this crisis leads serves as a wake up call to politicians. Given what we have seen this week, finding a balance between short-term goals and long-term sustainability and making difficult decisions to reduce budget deficits will require substantial changes in the way politics and policy are done in the U.S.
Barry Eichengreen has written a great piece for the blog The Irish Economy. He is known (as he states himself in the introduction) as being one of the most pro-Euro(pean) of the U.S. academics but he feels that the handling of the Irish situation is a disaster. The fact that the Irish government that had a very healthy fiscal position before the crisis ends up with an exploding debt because of the bailout that it provided to private banks, does not sound right to him. Why were holders of Irish bank bonds protected from the failure of these banks? This is not a new question, it has also been raised in other countries where governments have stepped in to ensure the viability of the financial system. But the magnitude of the debt burden that the government is passing to tax payers in Ireland is such that is potentially making the Irish government insolvent. Eichengreen is pessimistic and he thinks that the provision of the liquidity that the Irish government will receive is simply postponing the inevitable. And the only reason why the other countries agreed is because they are trying to protect their own banks who hold the debt of the Irish banks. So Barry Eichengreen sees debt restructuring happening soon and he is probably right. And his prediction is not about the economics of debt and deficits; in principle, governments could pay a very large amount of debt with future tax revenues. The real question is whether this is politically feasible. Will Irish tax payers be willing to pay for the failures of these banks? Not obvious when you look at the potential payments associated with current debt levels. The European crisis = the Euro crisis? "The Euro is to blame for the current crisis in Europe". I am sure this sentence sounds familiar to many. The argument is simple: as Euro members cannot devalue their currencies anymore, they do not have an option to improve their economic conditions (by favoring exports), growth suffers and their high levels of debt become unmanageable. 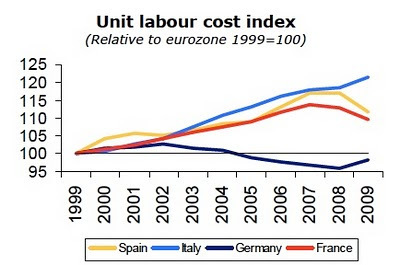 The Euro area is not an optimum currency area (it lacks labor mobility, fiscal transfers, etc.) so this was a crisis waiting to happen. Paul Krugman says it here, Simon Johnson says it here and you can find many more articles in the business press repeating these arguments. Let me (partially) disagree with that statement and just bring an alternative view to this issue. It is not a view that denies the importance of exchange rates or the fact that the constraints of the Euro area (one monetary policy might not fit all) might be hurting Euro economies but I think that it is healthy to question our priors on the importance of the exchange rate in explaining some of the empirical phenomena we observe these days in Europe. A couple of disclaimers before I present my arguments: these are difficult questions to answer. When looking at historical episodes, one needs to control for all variables and their behavior during that time. I will not do that here. Partly because those arguing about the costs of the Euro do not do it either, partly because it will involve heavy statistical analysis which might not be suitable for a blog. A second disclaimer: I will use Spain as an example because it tends to be used as an example of the problems faced by Euro members and because it is seen as the next in line to ask for funding (it is not related to my nationality...). Spanish unemployment has reached 20% during the current crisis and there is a sense that unemployment will remain very high for the foreseeable future. 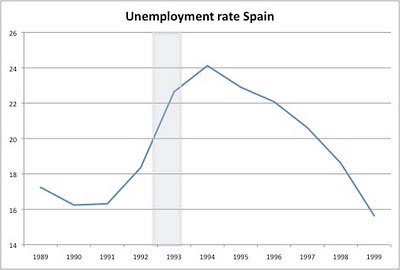 The logic says that if Spain could devalue, unemployment would fall very fast. How fast? Let's go back in time to when Spain could and did devalue. 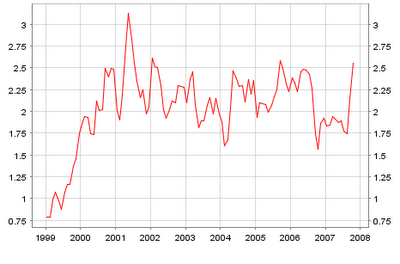 The previous recession in Spain (if we do not count the slowdown in 2002 as a recession) was in 1992/1993. At that point Spain had a fixed exchange rate relative to other European currencies. Prior to the crisis it had gone through a period of real exchange rate appreciation (because of high inflation) that had eroded its competitiveness. Very similar to what we saw before the current crisis. 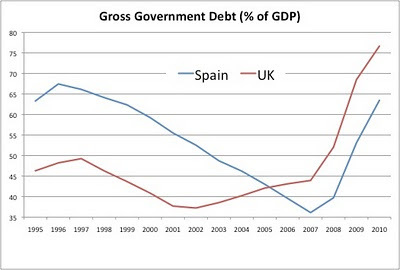 The difference is that in 1993 Spain decided to devalue its currency (three times between June 1992 and September 1993). What happened to unemployment during the years that followed? Below is the picture of the unemployment rate before and after the devaluation. We cannot compare with the current crisis yet, we will need to wait a few years before we see how fast or slow unemployment comes back to a "normal" level, but as we can see in the chart below, unemployment remained extremely high in the years that followed the devaluation of the peseta. Growth picked up but not fast enough to generate employment at a fast enough rate. Second observation: if staying outside of the Euro area produces significant benefits, a quick comparison between the UK and Spain should be very revealing. The UK has seen a large devaluation of the Pound during the crisis while Spain had no option to devalue its currency. Below are two charts that summarize the fiscal tensions that each of these two countries are witnessing in terms of fiscal policy as well as the overall economic growth before and after the crisis. There are many ways to read these charts and I am aware that I am abstracting from many other variables but keep in mind that they could make the argument stronger or weaker depending on how you read those other variables. For example, one could argue that the real estate bubble in Spain was more significant than the one in the UK (which is true if one looks at activity in the construction sector as a measure of the bubble) so it is likely that the crisis had a much larger effect on Spain than the UK. 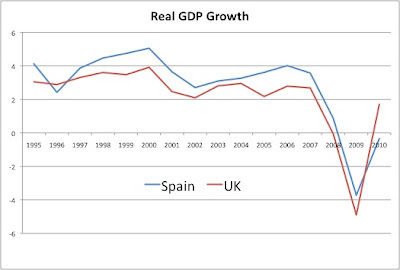 One could argue, on the contrary, that the crisis of the financial sector had a larger impact on the UK than in Spain so it should be the UK economy that had a sharper downturn. I ignore all these arguments and simply compare a couple of variables during these years (by the way, data coming from the World Economic Outlook Database, IMF). My reading of these two charts is that differences so far are small. 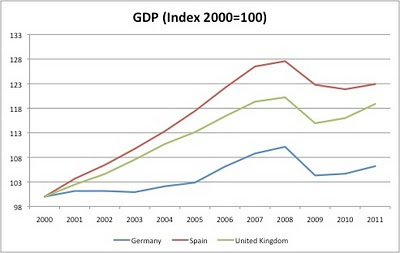 The best argument one could use to highlight the costs of the Euro for Spain would be the forecasted growth for 2010, below that of the UK (but this ignores a better performance during the previous two years as well as possibly the positive effects of the Euro in the years that preceded the crisis). Apart from this, the rest looks very similar. In fact it looks as similar as if I were to compare a pair of two random European countries (within or outside of the Euro area). 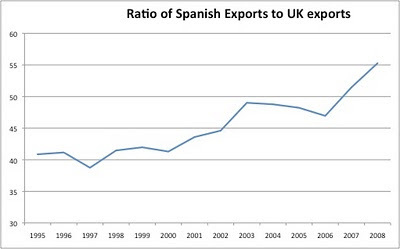 A more direct comparison of the effects of the Euro could potentially be seen below in a chart of the relative performance of Spanish and UK exports since 1995. Despite the deterioration of competitiveness of Spain because of the Euro (and higher inflation), exports grew at a faster rate than in the UK (data is from WDI, World Bank, exports measured in current USD, last available year 2008). So if the Euro is not to blame what do we make out of all the efforts of countries like Germany or France to try to save the offenders (Greece, Ireland, Portugal and Spain) from default? Isn't this linked to the Euro project and a potential failure of this project? Maybe, but there is something which is at least as important: in an integrated area (the European Union not to be confused with the Euro area), there are so many economic linkages, both in trade and capital flows, so that the performance of each individual economy is strongly linked to the performance of others. This is not because they share a currency but because they are highly integrated. Sweden has announced that they will provide funding to Ireland - this is not because they share a currency (they do not), but because there are strong links (e.g. financial links) that makes it in its best interest to do so. The Mexican bailout after the 1994/95 crisis had nothing to do with the sharing of a currency but with the economic interests of the US (and the IMF) in not seeing Mexico go into an even deeper crisis. And in that case, as it would happen with Spain or Ireland today, the existence of a currency in Mexico made matters worse as the devaluation sent all the USD liabilities of the Mexican economy to an unsustainable level. Sharing a currency has its costs and benefits. The costs are mostly about losing the ability to manage monetary policy as a stabilizing tool. These costs tend to be more visible during times of crisis when we are asking monetary policy to act strongly. So no surprise that this is a good time to ask ourselves whether the Euro is working and whether it was a good idea in the first place. But to reach a conclusion we need to look a broader set of issues that go beyond sharing a currency and a central bank. If we simply stick to the textbook conclusion of why fixed exchange rates are bad, we might miss the bigger picture. In recent speeches, Ben Bernanke has referred to a(n) (implicit) target of around 2% for inflation in the US. The U.S. Federal Reserve, together with the Bank of Japan, is one of the few central banks in advanced economies without an explicit inflation target. It is interesting that the expression “2 percent or a bit below” happens to be almost identical to the way the ECB currently refers to its mandate for price stability. Some history about the ECB mandate: Originally, the ECB was given the mandate of maintaining “price stability”. This mandate was later (October 1998) made precise by the governing council of the ECB as “a year-on-year increase in the Harmonised Index of Consumer Prices (HICP) for the euro area of below 2%”. At that point there was also a reference to this target, or to price stability more generally, a a mandate “to be maintained over the medium term”. This initial definition of price stability by the ECB received some criticism because it was leaving too much room for interpretation: Is any inflation rate below 2% consistent with price stability? Is deflation consistent with price stability or even desirable? This led to a redefinition of “price stability" by the governing council of the ECB in May 2003. At that point, the mandate of price stability was defined as “maintaining inflation rates below but close to 2% over the medium term”. So 2% becomes a ceiling (for the medium term) and the goal is to be close enough to the ceiling. Clearly, in this definition there is a sense of asymmetry: 2.1% inflation is worse than 1.9%. The words chosen by Ben Bernanke are almost identical to the words chosen by the governing council of the ECB where “below but close” has been replaced by “or a bit below”. What is the record of the ECB? Clearly the ECB has managed to keep inflation very close to 2% and as such we could call it a success. However, given the definition of price stability, it seems that inflation has remained many more months above than below 2%. 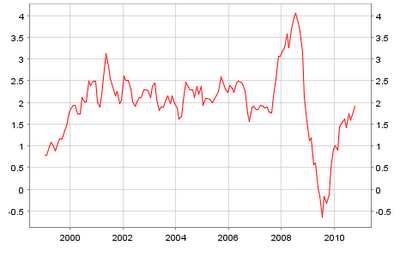 Below is a picture of Euro inflation from the launch of the ECB until the recession of 2007/2008. Inflation is close to 2% but it would be more accurate to describe it as “above but close to 2% than “below but close to 2%”. Or using Bernanke’s words “2% or a bit above”. If we add the last two and a half years of data (picture below), towards the end of 2007 inflation increased substantially and then it fell during the recession, below the 2% target. Today, inflation is once again approaching the 2% target. One more posts on the inflation outlook in the US related to our earlier post. With the release of the last CPI data from BLS, we continue to see a downward trend in inflation. In particular, we have seen the smallest annual change in core inflation since 1957. This is a good opportunity to reproduce the chart below (via Mark Thoma, original source San Francisco Fed). 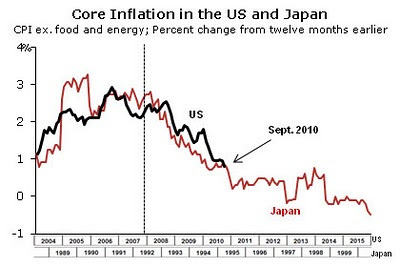 It compares the evolution of core inflation in the US until September 2010 with the evolution of core inflation in Japan in the months that preceded deflation. Quite similar so far. The US is today where Japan was in mid 1995. Let's hope that the months ahead show a divergent path between the two lines. How negative should real interest rates be? Standard monetary policy is about setting short-term nominal interest rates. Most macroeconomic models assume that inflation is sticky (constant) in the short run and by moving nominal interest rate the central bank is actually setting the real interest rate and by doing so influencing spending (consumption and investment) decisions. Of course, these spending decisions might depend on long-term interest rates and therefore we also need to understand how short-term interest rates affect both nominal long-term rates and inflation over a longer horizon (where we cannot assume that inflation is constant). We can use this logic to think about the most recent quantitative easing policies announced by the Fed. That's what Mark Thoma does very well today in his blog. One issue that I am missing in his analysis is how we think about real interest rates (not just nominal) in the current context. This is very much related to the defense that some Fed officials have done over the last hours of their policies. For example, in his interview with the WSJ, Janet Yellen argues that QEII (the next round of quantitative easing) is not intended to raise inflation. That the Fed is happy with an inflation rate below but close to 2%. I understand the importance of having a "low and stable" inflation target but we need to keep in mind that these targets should be interpreted in a medium-term framework, we are not asking the central bank to deliver a constant 2% inflation every month, quarter or year. And given that the Fed has refused to adopt a formal inflation target to keep its flexibility to set inflation on a short-term basis, why do they seem so obsessed with ensuring that inflation always stays at or below 2%? Even the ECB that is some times seen as putting too much emphasis on inflation has let the Euro inflation rate go above 2% during many of the months it has been in existence, so a little flexibility above 2% in the communications of the Fed might not hurt. We can also think about what all this implies for real interest rates, by asking: what should the level for real interest rates be given current economic conditions? We know that with short-term rates at zero (and they cannot go lower)sending a strong message about inflation being below 2% sets a floor for how low real interest rates can go (the floor is -2%). Estimates of what the appropriate real interest rate is in the current situation (which tend to be made within the context of a Taylor rule) vary but some suggest that real interest rates might need to be even lower than that [By the way, I find this related post by Krugman very useful to understand the logic behind negative real interest rates]. In addition, we have the issue of the dynamics of expectations and actual inflation. It might be that Fed officials by sending a very strong message about not wanting to increase the inflation rate above 2% will keep inflation expectations low and actual inflation remains significantly lower than the 2% "target". My guess is that their conservatism when it comes to inflation is the results of the strong criticisms that they have received (both at home and abroad), which has sent them into a defensive position where they need to reassure everyone that their current policies are not about raising inflation. But this might not be optimal, while anchoring long-term expectations of inflation around a low target is reasonable, there is nothing wrong in admitting that one of the goals of the current policy is to ensure that inflation stops falling and that we go back towards 2% or even higher in the short-term. We have all heard many jokes about economists and how difficult it is to get them to agree on anything. Most economists always answer a question starting with the words "it depends" and then follow with the expression "on one hand...". I am not here to defend (or criticize) my profession but to point out how difficult it is these days to get a consensus among some basic macroeconomic issues. As an example, the debate about whether inflation or deflation is more likely, and about whether the aggressive response of central banks is appropriate today is at the heart of some of the most basic issues in macroeconomics. The disagreement could potentially be the outcome of a more uncertain world but seeing how strong are the beliefs of those who express a view on this subject, it seems that we do not have that much uncertainty at the individual level (those who believe that there will be inflation seem quite sure about, same for those who are concerned about deflation) but rather a polarization of views. One example that I always find interesting is the debate that one finds in the minutes of the monetary policy meetings at the Bank of Japan. When discussing the inflation outlook in Japan in recent yeras, you can always find views on both sides, those who are concerned with deflation and those who are concerned with inflation picking up. Here is a paragraph from the meeting back in April 2010. Of course, given the last 10 years of data in Japan, it seems awkward that some are concerned with the upside risk to inflation. While one cannot completely rule out this possibility maybe erring on the other side, making the mistake of letting inflation be "too high", for a few years would be good for the Japanese economy. Clearly the US or Europe are not in the same situation as Japan but given some of the recent commentary about inflation I wonder whether we are getting close to a debate with too many hands and too many scenarios that leads to a lack of strong actions in the right direction. One can make mistakes in both directions (too much or too little inflation) and only time will tell in which direction our mistakes go, but given what we know about inflation, inflation expectations and long-term interest rates (all of them are low, stable or falling), it seems that we are worrying too much about the potential mistake of being too aggressive when it comes to monetary policy. "The system should also consider employing gold as an international reference point of market expectations about inflation, deflation and future currency values. Although textbooks may view gold as the old money, markets are using gold as an alternative monetary asset today." In this case I have to agree with the textbook view of gold as the "old money". The best argument in favor of using gold as a reference for currencies or central bank policies is to provide a nominal anchor in order to avoid inflationary policies (i.e. constraining central bank policies). The debate today about currency values/manipulation is about the relative price of different currencies and not about irresponsible monetary policy that might lead to inflation (to be more precise, some are afraid that the current monetary policy stance of many central banks will lead to high inflation but so far there is no evidence of high inflation and some countries are still facing the risk of deflation). So I am all in favor of debating the need to come back to a system of fixed exchange rates (or even a one-currency world) but I cannot see how gold could play a role in that system. What do you do when you find out that the house that you live in is not worth as much as you thought? Or you realize your salary will not increase at the speed you anticipated? Or you simply realize that your debt levels are higher than what you had assumed? The recipe is likely to be a combination of reducing spending and coming out with some good ideas to increase your income. Many advanced economies face a situation of excessive debt (public, private or both) that resembles one of the examples above. As a result, we talk about the need for fiscal adjustment, deleveraging in the private sector, increased saving, etc. But all these adjustments are required at a time when the economy is suffering from the consequences of a very deep recession. While those adjustments are necessary, they can have negative consequences on the economy (i.e. lower growth) which will make the adjustment more painful. As an example, it might be necessary to lower the consumption to income ratio, but the pain that the consumers will feel depends on what happens to the denominator (income); it is easier to reduce the consumption to income ratio when income is growing than when income is stagnant or even decreasing. I do not think that many disagree with this logic but there are two aspects where I find some confusion in the discussion: they are about the speed (how fast to go?) and timing (when to start?) of the adjustment. On the speed of adjustment, we read many times the argument that the adjustment needs to be fast. We hear, for example, the need for ambitious targets for government debt reduction or how we have to ensure that households’ or companies’ balance sheets become healthy as soon as possible. There are some merits to these arguments. Governments need to show commitment to sustainability and consumers or companies need to be in a financial position to be able to do business as usual. But there is also an argument that says that we need to go slowly. 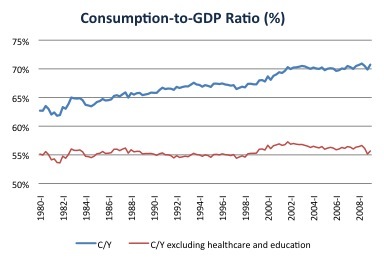 The argument comes from what economists call “consumption smoothing” that refers to the principle that most individuals prefer a stable consumption pattern to a volatile one. If you win the lottery, it makes sense to spread the new income across many years. If, on the contrary, you realize that your wealth is smaller than what you thought, it also makes sense to spread the pain over many years. This logic applies to individuals as well as to governments, as discussed in our previous blog entry. The second issue is timing. How to you achieve the necessary adjustment without hurting growth and income? Here the analogy of an individual fails to capture the complexity of this issue for a whole economy. As an individual I can reduce my consumption as much as I want without affecting my income. As a country, this is not true, as my consumption is linked to somebody else’s income. Of course, there is the rest of the world and a country could potentially reduce its consumption if the rest of the world replaced the demand for the locally produced goods but this is unlikely. This issue of timing is even more important in the current environment because we just went through a very deep recession. Should the adjustment towards reduced spending start now? When should governments start reducing budget deficits? The answer depends on our assessment of the output gap (the difference between potential and actual output). While there might be some questions about the size of the output gap, there is no doubt that it is significant. If this is the case, even if our main objective is to bring the necessary adjustment to the economy by reducing spending the best way to do this is by reducing the output gap first. Many times, reducing the output gap is portrayed as getting out of the crisis by spending more (which some see as a contradiction because excessive spending is seen as the cause of the crisis). This is not correct, reducing the output gap requires both spending and production. It is about ensuring that the economy produces as much as it can, generates the maximum (potential) amount of income so that the adjustment towards lower spending is done in the least painful manner. Discussions on the size of the output gap are always subject to uncertainty and today we witness a debate about the extent to which structural issues, not just cyclical, are behind the current low level of output in advanced economies. I am willing to admit that we need a combination of policies to reduce the output gap and some might be seen as “supply-side” policies. But it is difficult to believe that a large and quick adjustment towards a path of lower spending will bring the economy closer towards potential in the short term; it is likely to make matters worse. And whether excess spending is responsible for the crisis we just went through is irrelevant. Regardless of how we got here, we need to figure out a way to reduce the output gap by ensuring that the level of income, spending, production are all as close as possible to potential and this means more of all of them, not less. Fiscal adjustment: fast or slow? 1. Go slow: given that growth is still not strong enough and unemployment remains high, adjustment should be postponed as much as possible. A cut in government spending or an increase in taxes will decrease aggregate demand and growth. The costs of keeping the debt high are small compared to the costs of high unemployment. 2. Governments need to act fast because their high level of deficits and debt are creating too much uncertainty and fear of a crisis. In some cases this is showing up as higher interest rates (which can harm growth). In others, interest rates remain low but the fear of an unsustainable path for fiscal policy can lead to low investment and growth. A quick fiscal consolidation (reduction in deficits) is what the economy needs now. Both sides of the argument have merits and it is not a question of which one is right and which one is wrong. Circumstances are different in each country and it is likely that the optimal speed of adjustment is different for each economy. What I would like to highlight in this post is an area where I feel there is some misperception: the burden that interest payments on the debt impose on taxpayers, an argument that is used in favor or speeding up the fiscal adjustment. It is possible, although empirically it is not that obvious, that a high level of government debt has negative consequences on investment or economic growth. The high level of government debt can be seen as an accumulation of previous errors or misbehavior: governments spent too much or did not have the political willingness to collect enough taxes. But the past cannot be changed and the question we face now is how to pay for our previous “mistakes”: Do we do go for a quick payment of our debt or do we spread the pain over a long number of years? This is an economic decision that depends on many parameters but mainly on the relative value of current versus future income and the interest rate that we are charged on the debt (which in general equilibrium they have to be related). What we need to understand is that the cost of the debt will be there whether we pay now or we pay later. We might find good reasons why we should pay earlier but there might also be reasons why we want to postpone the payment (spread the pain over several years). Think about an individual who inherits some debt or that realizes that the total value of his debt is higher than what he initially thought. Is there an economic argument that he should cut his consumption as much as possible to avoid the higher interest payments on the debt? Not clear. This decision is about the trade off between consuming today and tomorrow and the price at which this trade off takes place. In most economic models, we assume utility functions for individuals that generate a preference for consumption smoothing, so we normally think about an optimal solution that requires slow payment of the debt. Same for governments, we normally think about tax decisions as being driven by a “tax smoothing” argument, which suggests that spreading the burden of high debt over many years or decades, is optimal. In addition, if we think about the present as a period where income is unusually low (because of the recession), this might not be the right time to start paying off our debts by cutting our consumption even more. In summary, one needs to be careful using the argument of the high burden of the debt to push for a quick reduction in government debt levels. The level of government debt is what it is and the burden will have to be paid in some form over the future. The question on how fast we reduce the debt is about the timing of those payments and not so much about the total cost of the debt. Paying earlier has to be a statement about how we are willing to cover the cost of debt with reduced current spending as opposed to reduced future spending. Of course, if financial markets are not willing to fund our debt anymore, we will be obliged to pay the debt faster. Or, in a milder scenario, if the interest rate we face is “unreasonably” high because of the fear of default, we might find it optimal to pay the debt now to calm that fear and reduce the overall burden of the debt – this might apply to Greece but it clearly does not apply to the US. VoxEU has published a new eBook on the current economic situation in Europe. The book is called "Completing the Eurozone rescue: What more needs to be done?". The book contains 13 short articles with an analysis of what went wrong and some concrete policy proposals to ensure a successful recovery and avoid similar crisis in the future. "Although the essays were largely uncoordinated – and the authors hark from diverse backgrounds – a remarkably coherent message emerges. The authors unanimously believe that the crisis is not over, and that the Eurozone rescue is not finished. More needs to be done. As Charles Wyplosz puts it, the Eurozone is levitating on the hope that European leaders will find a way to end the crisis and take steps to avoid future ones. Unless more is done, however, this levitation magic will wear off and the Eurozone crisis will resume its destructive, unpredictable path. The crisis, in our view, is a thorny tangle of incipient debt and banking crises. Until this tangle is sorted out, any further shock could threaten the Eurozone as we know it. After all, Eurozone bank systems remain in a parlous state. Confidence in the financial system has not been restored. The losses from the Spanish real estate binge have only partially emerged. Greek public finances have still not been stabilised. Large competitiveness imbalances persist. In short, none of the underlying causes of the crisis have been addressed. Massive shocks could come from any number of sources ranging from the Spanish banking sector to political crisis in member countries facing fiscal austerity. Indeed, we already see ominous signs. Risk premiums on some Eurozone government debt have resumed their upwards trend despite the two May packages. We also know that even small shocks can lead to a major crisis given the interconnected fragility of the Eurozone. Remember that it started with fiscal problems in a country which accounts for only 2.5 % of Eurozone GDP. Banking crises in a number of European countries could cause sovereign debt crises – a la Reinhart and Rogoff (2009) – which could spark contagion, thus triggering more bank crises. Trying to muddle through would be like sleepwalking through a minefield. The time for action is now, for, as Barry Eichengreen puts it, “financial crises feed on uncertainty. The longer uncertainty is allowed to linger, the greater the damage to confidence…”. Ilian and I wrote on of the essays where we are argue in favor of an institutional solution to the fiscal problems of the Eurozone. Our essay can be found here. The full set of essays can be found on this link. Last Friday INSEAD hosted its 4th Leadership Summit in its Fontainebleau campus. I participated in a debate on the architecture of the new global economy. The other members of the panel were Shanti L. Poesposoetjipto (Chief Executive Officer, PT Ngrumat Bondo Utomo), Ernest-Antoine Seillière (Chairman of the Supervisory Board, Wendel Group), Lord Simon of Highbury (Director GDF Suez, Former British Minister for Trade and Competitiveness in Europe, Former Chairman of British Petroleum) and it was moderated by Geoff Cutmore (CNBC). A video with a summary of the session is below. Other videos from the event can be found in the INSEAD YouTube channel. "We are not Greece". Many government officials from different countries have been claiming that their fiscal problems are not as bad as those of Greece: Portugal, Spain, Ireland or the U.S. Given the importance of credibility and "labels" in financial markets, many government are trying to distance themselves form the "Greek" label to ensure that their interest rate spreads remain under control. It is hard to deny that the situation of the Greek government is one of the most difficult ones among advanced economies, but how bad is it compared to other countries? The most recent IMF analysis of fiscal policy provides a nice summary of the difficulties ahead. 1. The effort in terms of adjustment to the government primary balance to maintain government debt levels at 60% of GDP in 2030. (see the full report for details, there are some technical assumptions that matter). This is measured in the horizontal axis. 2. The expected increase in Age-Related Spending during the 2011-2030 period. This is an important number because it informs us about the need to increase taxes (or reduce other components of spending) in order to achieve the necessary adjustment as calculated above in point #1. This is measured in the vertical axis. The best place to be is on the bottom/left quadrant where the adjustment is small and the projected increased in spending is small. The worst place to be is the top/right quadrant where there is a need for a large adjustment and where age-related spending is likely to increase fast. One clarification about this picture: Greece is not included in the IMF chart. The reason is that you need to use a starting point as a reference to calculate the necessary adjustment. Given the current turmoil and the constant change in budgetary plans, it is difficult to establish such a reference point in Greece. I have added Greece in the picture by using the information on the note that comes with the chart which states that Greece needs to adjust the budget balance by 9.2% after measures of 7.6% undertaken in 2010. Greece is the country that requires the largest adjustment in the (primary) budget balance, even after the proposed adjustment for this year. Greece also expects a significant increase in age-related spending over the next two decades. although others are in a worse situation. There is no country that looks exactly like Greece but there are a few that face a significant fiscal policy challenge. The United States combines the need for a very large short-term adjustment with an increase in age-related spending that is only second to Japan. Spain and Ireland are also in need of large adjustment although they face significantly lower pressure when it comes to age-related spending. There are many ways to look at fiscal policy statistics and future scenarios and there are some key assumptions that can dramatically change the position of each economy in this chart (assumptions on growth, interest rates,..). But looking at numbers rather than "labels" is always a good starting point. It seems that large bailouts are becoming the norm these days. TARP was 700 Billion, the recent agreement to support European governments is larger than $1 Trillion. Are these reasonable numbers? How large will the next one be? There is still some confusion about what these bailouts do. In their design, they deal with a situation of financial distress that some see as a problem of liquidity (short-term financing) but others see as a problem of solvency (the business or the government will never be able to generate enough funds to pay for the current debt). Policy makers are uncertain about whether liquidity or solvency is the true problem but they might see reasons under both scenarios to still go for the bailout. If it is liquidity, the reasons are clear, you do not want a large institution, a large government or the whole financial system collapse and drag others into financial distress. In the case of solvency, it is less obvious but there are still economic (or political) reasons to keep some companies or governments alive (as in the case of the car industry in the US). If liquidity is the real problem, the cost to taxpayers should be minimal or one could even imagine a profit from the lending. If solvency is the problem, there will have to be a transfer from taxpayers to the company or government in trouble. In the case of TARP, the plan to buy toxic assets in the US, there was always an understanding that some of the purchases would constitute a transfer to the financial institutions holding those assets but there was a lot of uncertainty about its financial amount. Today's estimates are more optimistic than some of the earlier ones with a total cost somewhere around $90 billion. In the case of Greece, we are talking about loans that do not imply a direct transfer to the Greek government. It could, of course, be that the interest rate charged to the Greek government is seen as below market and this could be considered a transfer -- but if the final goal is achieved and the Greek government does not default, then the market interest rates were simply overestimating the true risk and there is no transfer implied in the interest rate set by the loans. If Greece defaults and this default affects the bonds purchased by this rescue plan then there is a cost to the taxpayer. The reaction of financial markets (both the stock and bond market) to the plan is difficult to understand. The plan does not involve a direct transfer to the Greek government (or any of the other European governments that might need the funds). If the reaction was so positive it must either mean that the market believes that this was a liquidity problem that was just solved or the market reads more into the plan than what you see in the statement by the ECOFIN. Maybe they see the promise of a future transfer if liquidity problems turn into insolvency for the Greek government. My interpretation is that a direct transfer (not a loan) to the Greek government from other European countries is unlikely to happen. So the $1 Trillion plan looks more like a way to send a strong message (a number that was much higher than what most expected) and, at the same time, ensure liquidity over the months to come. It seems that the number matters more to the markets than the details. In practice, not much has changed. The government of Greece still needs to find the necessary revenues (taxes) to cover their spending and service the debt. They have bought themselves some time but the fundamental imbalance remains and it needs to be addressed. There will be other crisis and I wonder if this is a trend of designing larger and larger bailouts to make sure that they provide the necessary reassurance to financial markets. 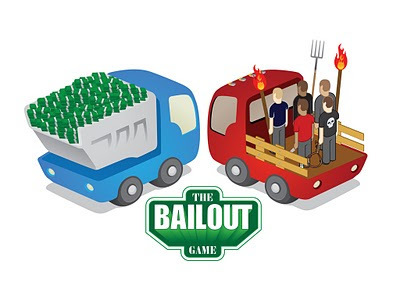 And if you want to look at the less serious side of bailouts, you can always play the bailout game (click here to access the game). Current account imbalances and sustainability of fiscal policy are two of the most important challenges that the world economy has to deal with in the coming years. They are both linked by the national account identity that states that the current account balance of a country is the sum of the private balance between saving and investment and the government balance. I spent some time at the IMF Fiscal Affairs department last year and as a result we produced an analysis of the empirical link between fiscal policy and the current account. Our goal was to analyze a broader sample of countries and to look at episodes of large changes, two issues that had not been studied before in this literature. The copy of the working paper can be found at the IMF web site. I have always been a fan of Edward Tufte and his work on the visual display of information (I am borrowing one of the titles of his books for the title of this blog entry). Below is a chart that I found via Brad DeLong on the path of job creation (or destruction) around the time of the change in the US administration. The original source of the data is the blog/web site of Nancy Pelosi (speaker of the US House of Representatives). Nice contrast between the Bush and Obama administration. There are, of course, different ways of looking at the labor market performance during the Obama administration as Greg Mankiw has pointed out in his blog. 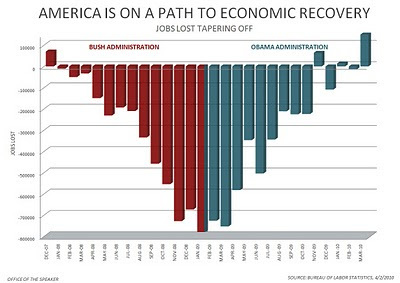 Below is a picture that he updates often on the difference between what the administration had forecasted as a result of the recovery plan and the actual unemployment rates. Same labor market, same data, but two very different messages depending on how we look at it. According to Paul Krugman, the Euro is one of the main factors behind the crisis in Greece and other European countries. The fact that Greece (and Portugal, and Spain and Ireland) cannot devalue their currencies is having a negative impact on their growth which lowers tax revenues, increases government deficits and raises the possibility of default. Martin Feldstein goes one step further and argues that if Greece could devalue, they would easily avoid default. I understand their argument, that exchange rate misalignments can have negative economic consequences but I think that blaming the Euro for the imbalances in government accounts is misleading. The work of Reinhart and Rogoff, summarizing eight centuries of financial crises is full of examples of countries with flexible exchange rates where governments default. There are also plenty of cases of countries with fixed exchange rates and large devaluations that not only do not avoid default but might be responsible for it (as liabilities where denominated in a foreign currency). "Interesting recent cases include Greece and Spain, countries that appear to have escaped a severe history of serial default not only by reforming institutions, but by benefiting from the anchor of the European Union." One thing that I am missing in the arguments of those who blame the single currency for the current European "crisis" (at least of confidence) is their recipe for the US in terms of exchange rate policy. The US government has debt levels that are likely to grow faster over the coming years (and decades) than in the case of Ireland or Spain (if we believe the OECD). The current US government deficit is similar and the projected US budgets for the next years in the US do not show a strong sense of restraint. There is no doubt that US fiscal policy is on an unsustainable path and there is a need to cut spending or raise taxes substantially over the coming years. In addition, the US has also displayed very large current account deficits in the last decades a sign (according to them) of the lack of competitiveness of an economy. How will the flexibility of the US exchange rate help the US going forward? If their recipes for Southern Europe are applied to the US, what should the US dollar do over the coming years? Depreciate? Relative to which currencies? Who will engineer that depreciation? As an academic, it is easy to find arguments against a certain exchange rate system (flexible or fixed). But we need to go one step further and suggest an alternative taking into account the empirical evidence we have accumulated over the last decades or even centuries. In my view, arguing that the Euro is one of the key factors behind the Greek crisis ignores the economic history of these countries and the true trade offs that they face between different exchange rate systems. Bringing government debt under control: how painful will it be? 1. There is no doubt that governments in advanced economies will have to go through major fiscal policy changes in the coming years to keep the debt-to-GDP ratio under control. Given current policies, debt-to-GDP ratios are likely to explode in some cases to 300 or 400% of GDP over the next decades. 2. The required changes are large. The recovery will bring deficits somehow under control but this goes nowhere in terms of achieving sustainability. Most advanced economies need to find additional revenues (or cut spending) by a large amount, somewhere in between 4 and 10 percentage points of GDP depending on the country -- and this has to happen every year for the foreseeable future (we are talking about many decades here). 3. There is no mystery to what needs to happen: governments need to increase taxes and reduce spending. Both have economic and political consequences and we need to be as smart as we can to choose changes that are efficient and have limited negative consequences on the economy (and growth). 4. Good news: We have seen large adjustments in government debt before so this adjustment is feasible. No need to go to the post-WWII decades, in the 80s and 90s we saw very large reductions in government debt in many advanced economies. We are talking about reducing the debt to GDP ratio by up to 40 percentage points in a short period of time, such as 10 years. 5. Good news (2): Some of these prior adjustments had limited consequences on growth. We normally tend to think about reductions in government spending and increases in taxes as having negative effects on growth but in several of these adjustments, growth accelerated rather than decreased (we refer to these events as "expansionary fiscal consolidations"). And when growth accelerates, this becomes a virtuous cycle as faster GDP growth reduces the debt-to-GDP ratio, generates tax revenues, etc. 6. Expansionary (growth promoting) fiscal consolidations tend to be associated to decreases in spending rather than increases in taxes and they tend to come together with a series of pro-growth reforms in other areas of the economy (Ireland post-1985 is a perfect example of this). - In some countries, government spending levels have come down relative to where they were in the 80s or 90s. It is not easy to produce a significant decrease in government spending without affecting some basic services provided by the government. 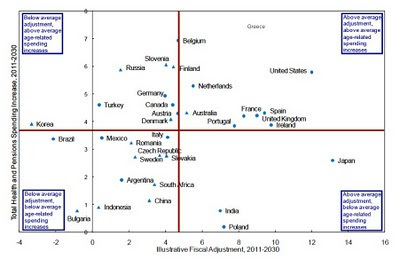 More so in the US where government spending is low relative to other (European) advanced economies. - Some of the expansionary fiscal consolidations benefited from falling interest rates. As an example, Belgium reduced government debt by close to 40 percentage points in between 1996 and 2006 but most if not all of the decrease was linked to falling interest rates on government debt. Currently, there is no room for interest rates to go down. If any, they might go up. - This time, the consolidation needs to take care of the past (the accumulated level of debt) and the future (the fact that projected deficits given current policies will be very large). The adjustment is larger than what was needed in some of those previous expansion. 8. So my guess is that a "painless" fiscal adjustment is unlikely this time. Taxes will have to play a stronger role and governments will need to strike a balance between the need for additional revenues and the potential negative growth effects that higher taxes might have. This balance will require a strong amount of political leadership and consensus. 1. Health care expenditures and GDP per capita. 2. Health care expenditures and imbalances prior to the current crisis. In the years prior to the crisis the US economy run large current account deficits, a sign of excess spending relative to income for the whole country. One of the components of spending that grew the fastest was private consumption. As a % of GDP it grew by about 4-5% of GDP. All of it can be accounted for by increases in health care and education as shown in the chart below (we have blogged about this before). 3. Health care and government debt. The projections for US government debt is that it will explode to a level of about 300% of GDP in the coming decades (assuming no change in policy). The biggest source of this explosion is health care costs. Yes, there are some other costs associated to aging (more need for healthcare and pension) but most of the increases in government spending comes from the assumption that health care costs will keep growing faster than GDP, as reflected in the chart below - where the units are % of GDP (Source: CBO). So maybe health care reform was a political distraction from other issues that required the attention of US policy makers, but there is no doubt that getting health care right is a key ingredient for many of the challenges that the US will face in the years to come. The debate on the possible undervaluation of the Chinese Renminbi is in full force among politicians and academics. Most agree that the Renminbi is undervalued but there are disagreements on the effects of exchange rate misalignments (are they they ultimate cause of current account imbalances?). Are exchange rate misalignments the main cause of current account imbalances? Here are two Nobel prize winners who disagree: Stiglitz says no and Krugman says yes. I will not resolve the debate here but there is something that I cannot understand in Krugman's argument. His argument is that current account imbalances cannot be corrected without an exchange rate change. While he does not say so, he almost implies that current account imbalances are always the result of exchange rate misalignments. This position is too extreme. The current account is the difference between national saving and investment. It is true that saving and investment will react to relative prices (which are determined by the exchange rate). But we can observe changes in saving and investment that are driven by many other factors and that have minimal impact on relative prices. Krugman's argument is that an increase in Chinese consumption will not reduce its current account surplus unless this consumption will translate into imports, and for this to happen we need a relative price change. Krugman is right in the sense that if an increase in Chinese consumption is directed towards local goods, their price will increase, which amounts to an exchange rate appreciation. But the fundamental question is what needs to happen for the imbalance to be corrected. His view is that we first need to get prices right and then the adjustment will happen. The alternative view is that Chinese will have to get used to consume more, Americans will need to understand that they need to save more and this will be the main factor that will drive the current account adjustment. Relative prices are likely to adjust and therefore the (real) exchange rate will have to change. How much? It will all depend on how easy we can find substitutes for the goods currently produced in China. It might be that it will not take much of an increase to find an alternative location for production (with cheaper labor) and prices will change very little. By the way, here is an interesting piece of data: while both the US and the Euro area have a large bilateral trade deficit with China (which can be interpreted as a signal of the undervaluation of the Renminbi), the Euro area has an overall current account surplus while the US has a current account deficit. You can argue that for the Euro area, an undervalued Renminbi shifts demand from other countries goods to Chinese goods. But this does not get reflected in the overall current account balance. Clearly there is more than an undervalued Renminbi in the dynamics of the current account in the US and the Euro area. And, yes, I am aware that we can argue that the Euro is undervalued relative to other currencies, as Martin Fedstein does, but then the argument becomes a tautology, every time we see a current account imbalance we conclude that it is because exchange rates are not right. The debate has extended to the broader issue of current account imbalances and the potential blame that the countries with current account surpluses (China or Germany) have on the weakness of the economic recovery. As an example, here is Martin Wolf (FT) arguing that Germany cannot be a model for the Eurozone because of its current account surplus. Germany is accused of having kept wage growth too low and therefore forcing a "depreciation" to be more competitive. I am not sure what Martin Wolf proposes as a solution. Charles Wyplosz gets it right in his article: Germany should be running a current account surplus to save for the future and this is what many other advanced economies should be doing. Many governments of advanced economies are struggling with large deficits and increasing debt. When the crisis is over some of these countries will find themselves with levels of government debt that we have not seen since the end of World War II and, in many cases, close to double the amount before the crisis started. Some European countries, Greece in particular, but also Portugal, Spain or Ireland are under enormous pressure to control their deficits as they see their interest rate spreads grow. Who is in more trouble? Why is it that some of the countries that were used as models of fiscal discipline (Ireland or Spain) are now under attack? A quick look at government debt (as a % of GDP) reveals very high levels for may advanced economies. The first question is which measure of debt to use: gross or net. Gross debt is simply the stock of outstanding government debt. 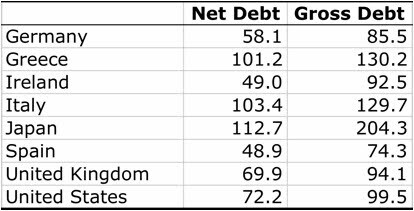 Net debt is the difference between gross debt and the financial assets that government holds (Note: the definition of net debt is not identical for all countries. Not all governments include the same type of financial assets). The table below shows gross and debt levels for a group of advanced economies (this is a forecast for 2011 done by the OECD). It is clear that the difference between gross and net debt is very large for some countries. While Japan looks like an outlier in terms of gross debt, it is close to Italy and Greece when it comes to net debt. In principle, net debt is a more appropriate measure of government indebtedness. If governments have a significant amount of assets, they need to be considered when thinking about the solvency of their accounts. In some cases the government (at large) holds some of its own debt in pension funds for public employees or the social security fund (this is why in the US the most common measure of government debt is "debt held by the public" which is a measure very similar to the concept of net debt), this debt is not a liability for the government. There are, however, some concerns with the concept of net debt. In addition to some measurement question (which assets to include, at which value), the government needs to refinance all its gross debt and not only the net part, so in terms of flows, it is the gross debt that matters. Also, while it makes sense to exclude government debt held by the government, some of this debt is part of a fund that covers future pension liabilities that are unaccounted for in the budget. And here is where the assessment of government solvency gets more difficult: what you really want to do is not just to look at government debt but also at future revenues and liabilities. Doing these calculations requires many assumption about the future so there is always uncertainty about these assessments. Below is a chart from an article by C.Hagist, Stefan Moog, Bernd Raffelhuschen and Johannes Vatter that calculates what they call "implicit government debt" as the net present value of future liabilities minus future revenues. The numbers are dramatic for some countries and there are are large difference between some of them. 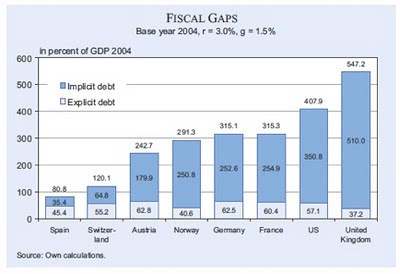 While Spain or Switzerland have levels of implicit debt that are "low", the US or the UK have levels of implicit debt that make the total debt four or five times higher than the current level of debt (total indebtedness of the UK government is 547% of GDP). This does not mean that the US and UK government are broke (or more likely to default than Switzerland). What it says is that relative to current policies, the US and the UK require larger increases in taxes or decreases in spending to stabilize their debt. A similar analysis of the fiscal gap for the US has been done by Auerbach and Gale and they reach similar conclusions. The fiscal gap for the US government today is between 5% and 7% of GDP. Meaning that if the government wants to stabilize the debt at current levels over the next 8 decades, they need to increase taxes or cut spending by five percentage points of GDP (every year for the next eight decades). This is a very large number given that total federal tax revenues stand today at 15% of GDP (so 5 extra points amounts to a 1/3 increase in taxes!). Given these numbers, why is it that Southern European countries are under more pressure than the US or the UK? It is all a matter of credibility and the trust in the ability of these governments to get their budget under control. It might be that the UK needs a larger effort than Ireland but the question is which one is more likely to deliver on this effort. And the moment credibility is low, interest rate spreads increase and the fiscal gap increases as well as you need to generate more revenues to simply cover the interest payment on the debt. Credibility will always be a subjective assessment and it is always easy to argue that markets are getting it wrong (or right) for a given country. What is important is to understand the numbers, not just the current ones but the future ones as well, before making that assessment, otherwise we are only seeing the tip of the iceberg and ignoring the true size of the problem. In today's Financial Times, Wolfgang Munchau writes about "Why the Euro will continue to weaken". He makes an argument that we have heard before: the political tensions, the economic tensions created by the Greek debt problem make it clear that a monetary union without a political union cannot be successful. I will ignore the general question on whether a monetary union can succeed without a political union so that I keep this entry short, but I want to challenge his reading of exchange rates. Let me start with the areas where I agree with the FT article: Is the Euro getting weaker? Yes, relative to the US dollar. Is this caused by the perception that some of the economic troubles in Greece and other European countries could cause instability in the Euro area? Yes. Here is where I disagree: Is the Euro a weak currency? To be honest, I cannot answer this question unless we agree on a definition of "weak". If by "weak" we mean that its current value is low relative to some benchmark (and we also need to agree to a benchmark), the answer is NO. The Euro remains overvalued according to purchasing power parity (PPP), which is the most fundamental theory we have about exchange rates (I am aware that there are more sophisticated models to think about over/undervaluation of currencies but at some point they need to rely on some notion of purchasing power parity as a long-term anchor). The current value of the Euro (about 1.36 USD/EUR) is higher than what most PPP estimates indicate. Those tend to be in the range 1-1.2, depending on the basket of goods that you use. If any, the Euro remains overvalued. We reach a similar conclusion is we look at the historical evolution of the USD/EUR exchange rate (see chart below) where the German Mark is being used as the Euro in the pre-1999 period. My second disagreement with the article is about the connection between political and economic turmoil and exchange rates. Why should the current European environment lead to a depreciation of the currency? The informal argument is that the currency reflects the "strength" of an economy. This sounds ok but it is not right - you first need to define "strength" and then be clear about the exact economic mechanisms through which the exchange rate is affected. Wolfgang Munchau argues that Europe needs to go through a major fiscal adjustment and this implies an increase in public saving. Given that the sum of public and private (net) saving have to be equal to the current account, and assuming that we do not want private saving to fall, we need to see the current account going up (exports growing faster than imports). For this to happen, you need to see a depreciating Euro. This logic is not right either. If we apply the same logic to the US or the UK we will reach the same conclusion: we need a depreciating US dollar and a depreciating UK Pound. But this is impossible! We cannot have the three currencies depreciating at the same time (at least relative to each other). The argument that the political tensions in the Euro area will lead to a weaker Euro are not new. 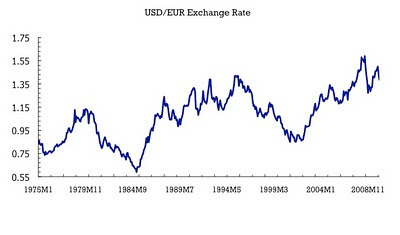 They were in fashion during the early years of the Euro when the Euro was getting weaker (as low as 0.85 USD/EUR). Funny enough, those theories became irrelevant in the period 2003-2007 when the Euro appreciated by close to 100% relative to the dollar. And this was at the time when the political and institutional weaknesses of the Euro area became really apparent. It was during the 2003-07 period when the stability and growth pact collapsed, it was during that period when several countries did not live by the deficit and debt limits that they had agreed to and the confidence in the Euro-institutions was seriously damaged. But during those years the Euro got stronger, not weaker. Theories about why exchange rates move need to be tested over several episodes. Otherwise we are simply looking for an ex-post rationalization of the changes we see. The current budgetary crisis in Greece has led to concerns about the stability of the Euro zone as a single currency area. There have been talks about the possibility of some countries leaving the Euro area and some see this as a clear signal that having a single currency among such a diverse group of countries was a bad idea. A few academics in the US have reopened the debate on whether the Euro zone is indeed “an optimal currency area” and their conclusion tends to be that it is not and the crisis with Greece is a proof of that analysis. Their logic of those who believe that the Euro was a bad idea is the following: if today countries such as Spain, Greece or Portugal (or Italy) had their currency, they could have devalued it (or depreciated it) and this would have helped them to get out of the crisis because of the positive effect on exports. They point out to the fact that in recent years some of these countries have lost competitiveness through high inflation and this could be easily corrected with a devaluation while the alternative of deflation (or lower inflation) is more painful. Their argument is a standard textbook analysis of the costs and benefits of keeping your own currency (where we are looking at just the benefits). This is an argument that I bring up regularly in class when I teach macroeconomics and it is easy to explain to my students. However, one needs to go beyond the theory and what is difficult is to assess whether the logic applies to this case and indeed these benefits outweigh the costs of having your own currency and exchange rate. My reading of the current situation is that it does not reflect at all on the weaknesses of the Euro zone as a currency area and that if any of those countries had kept their currencies they would be in much more trouble today. 1. This is a global crisis. The current recession is global in nature. While some countries are hurting more than others, this is not an asymmetric shock that is affecting just one country. While the exports of Greece could benefit from devaluation, this would hurt the exports of other countries. While it is true that some countries like Germany have kept a surplus in their current account, it is also true that their exports have collapsed and their GDP has been affected as much or even more than some of those other countries. Why shouldn’t be Germany the one who devalues? 2. Is competitiveness a problem? A potential answer to the question in point #1 above is that Germany does not have the same problems of competitiveness than the Southern European countries. It is Spain, Portugal, Greece the countries that have seen their real exchange rate appreciating because of higher inflation than in Germany. They are the ones that need the correction. This is true but we have to be careful not to use Germany as an example of all other countries. 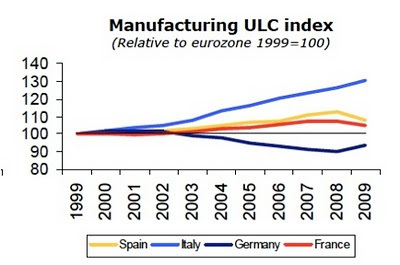 The chart below (from a presentation by Jose Manuel Campa, from the Ministry of Economy and Finance in Spain), Spain has not seen a deterioration of competitiveness relative to France, the second largest economy in the Euro area. 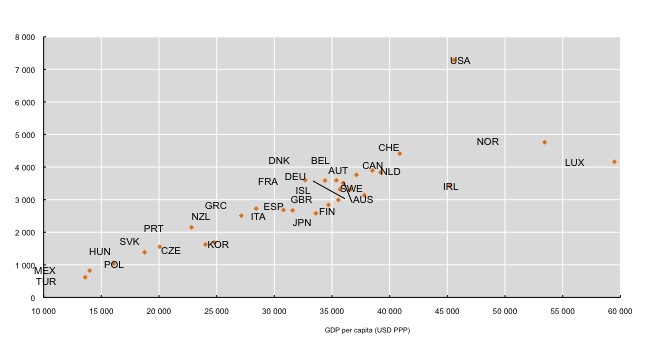 It is Germany the one that looks like an outlier. In addition, inflation was higher in Spain mainly because of the evolution of prices in the non-tradable sector (the one where competitiveness is not an issue). Below is another picture from the same presentation by Jose Manuel Campa where we see that the evolution of unit labor cost in manufacturing in Spain (relative to Germany) are much more moderate. If this is not reassuring enough we can look at the evolution of Spanish exports (as a share of world exports) during these years, Spain has done better than countries like France or the US and its performance is similar to that of Germany. Yes, Spain had a large current account deficit during these years but it was mainly the result of increasing imports due to the strong expansion in the economy. A phenomenon that we observed in other countries (such as the US) that have a flexible exchange rate. 3. Exchange rates are not a magical tool. If having your own currency is such a powerful tool to deal with crisis like the current one, why is it that countries such as the UK, Sweden or the US are suffering through very deep recessions? Both the UK and Sweden, despite having witnessed a depreciation of their currencies, are also struggling with a deep recession that seems to be lasting as long as in some of the Euro countries. In the case of the US, the currency has moved in the “opposite” direction and appreciated since the beginning of the crisis. The current account has been reduced but mainly because of the collapse in demand that comes from the recession. 4. We cannot forget the costs of having your own currency. While the idea of manipulating the exchange rate to increase exports might seem at times attractive, there is no doubt that if any of the Southern European countries had their own currency today, they would be in a much deeper recession (we can go back to the early 80s in Spain when there was also a banking crisis to see how much the Spanish peseta helped). It would be very likely that these countries had accumulated during the boom years liabilities in foreign currency that now, with a devaluation, they would not be able to pay back. The government of Greece would be facing a much higher interest rate because of exchange rate risk, which would make the probability of default even higher. Finally, a reminder that one needs a longer perspective to assess the benefits and costs of a monetary union. Yes, countries like Spain are going through a deep recession with very high unemployment rate but partly this is the result of the “excesses” of the previous years. Below is a picture of real GDP that shows the very-high growth rates that Spain enjoyed during the previous years. While it might be the case that there was some loss of competitiveness relative to Germany, the growth rate of Spain remained very high, higher than that of Germany or the UK who had the flexible exchange rate to adjust (if needed). Yes, the current recession will erase some of these gains, but not all of them. So maybe the Euro was not such a bad idea after all and it deserved a less dramatic 10th anniversary.